Gather your photos and create cheap holiday photo cards using our large selection of templates. 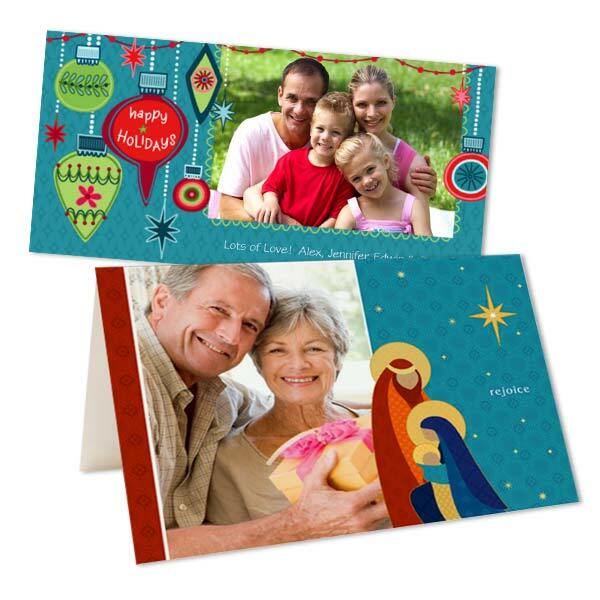 We offer everything from cardstock photo Christmas cards to folding Hanukkah greetings. You can select from three classic card styles and pick from hundreds of templates for any holiday occasion. Once you’ve decided on a greeting, upload your photo and get creative with our online card maker! Not only do we offer dozens of holiday templates, you can choose from three classic card styles to create the perfect greeting. Our double sided Christmas cards have a professional look since they’re printed on durable card stock. Customize yours front and back with a photo collage on the front and your own holiday message on the back. Speaking of cardstock photo cards, our folded photo cards are also printed on the best quality card stock. Design each panel front and back with last year’s holiday photos, pet pictures, your kids’ school photos, and more! Customers particularly like our glossy photo paper greetings. They’re ideal if you’re looking for inexpensive photo Christmas cards but don’t want to sacrifice quality!